This is it, y’all! It’s the end of Transportation Station. This week, we started Sights & Sounds of Winter. Can you believe it? There are only a few more weeks until Christmas. I’m so excited and of course the little guy is too. One of our activities last week involved engineering some DIY railroad tracks. He definitely has lots of train stuff, but these ones that we made ourselves were still a favorite around here. 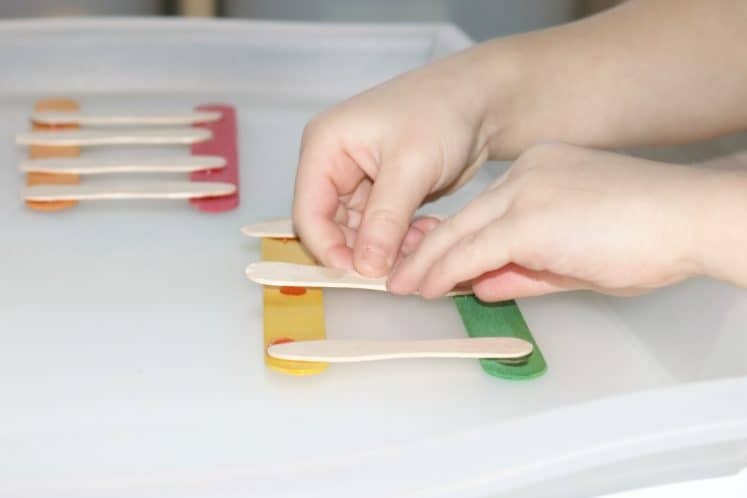 They were so quick and easy and the supplies were things that we already had around the house. 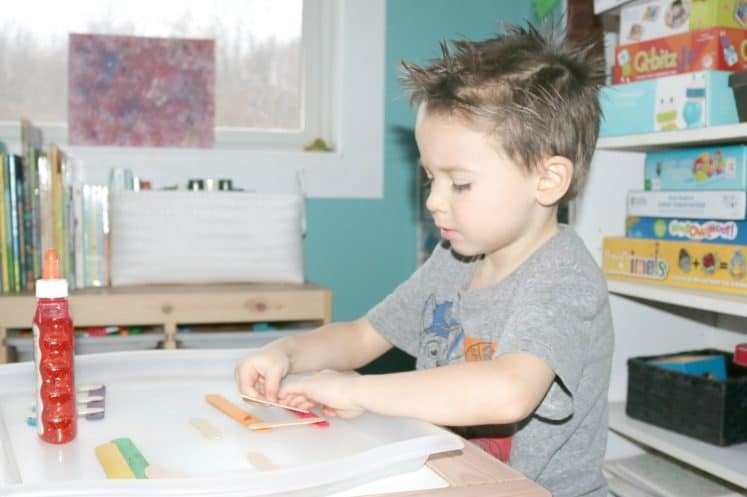 The Investigation Station ideas that we get with each of our preschool curriculum kits are all kinds of awesome. 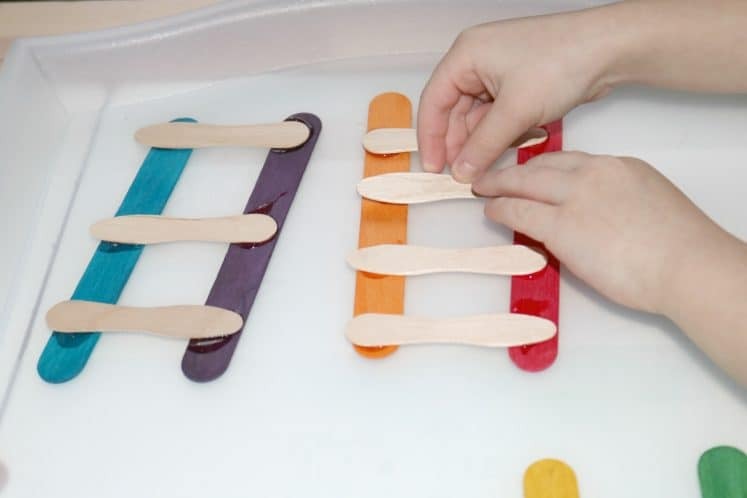 Each week, our Teacher Guide gives us five ideas for hands-on, STEAM learning and we both definitely look forward to them. Print a photo of train tracks and tape it near the block area. Set out a bowl of craft sticks and glue. 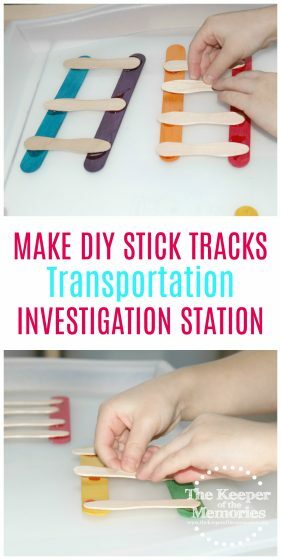 Encourage children to arrange the sticks to build train tracks. If desired, glue the sticks together. How did you make train tracks? How many sticks did you use? Could you make a straight track? A curved track? What could you make to go on the train track? Little kids almost always love things that go. 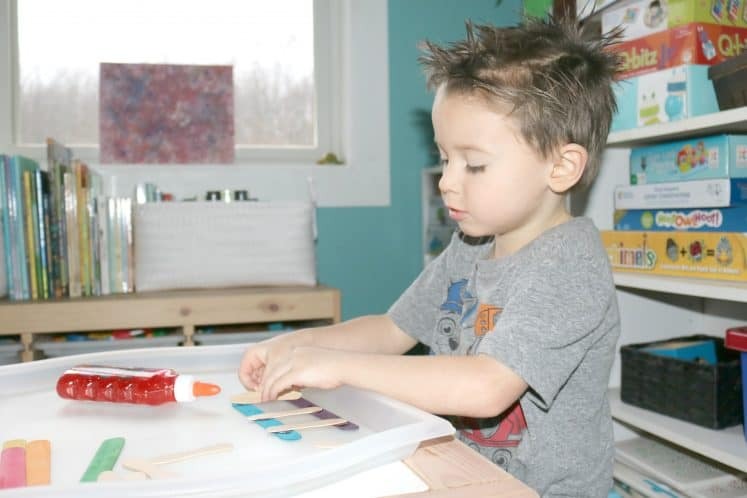 Whether we’re talking about trucks and cars or even trains, this theme has been a huge hit with the little guy. We almost always add a little something extra to our preschool activities and this one was no exception. 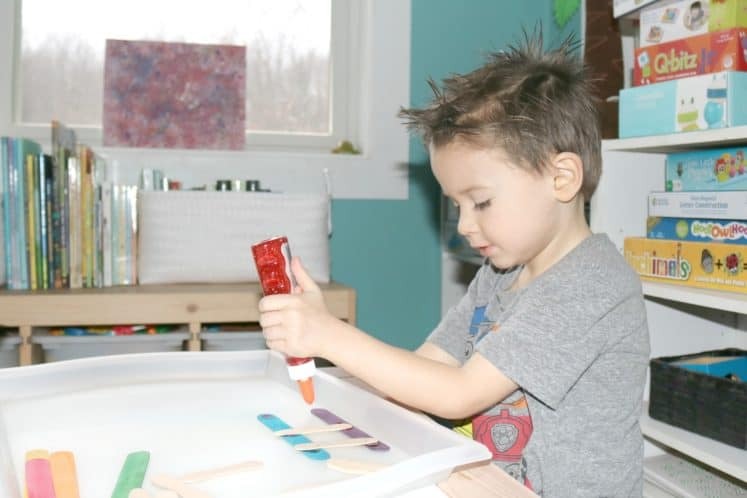 The little guy loves glitter glue, so when I mentioned that we needed some glue, he immediately grabbed a bottle and got to work. I seriously can’t get enough of these activities. Each Investigation Station encourages creative thinking and problem solving, which are skills that are incredibly important in today’s technology-driven world. What more could a homeschool mama ask for? Don’t forget to stop by next week if you’re interested in seeing what we’re up to with our Sights & Sounds of Winter theme. 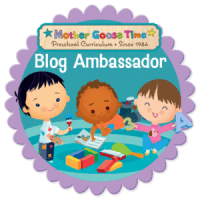 And if you missed this year’s preschool homeschool space post, you can check it out here.